When we moved into this house a few years back, it was a phenomenal upgrade for us in absolutely every way. I remember being particularly excited to see the RJ-45 Ethernet jacks in the study and the game room, because I’d never lived anywhere with network cable laced through the walls. As a computer geek, I like to have network accessibility everywhere, and sometimes wireless just isn’t good enough. 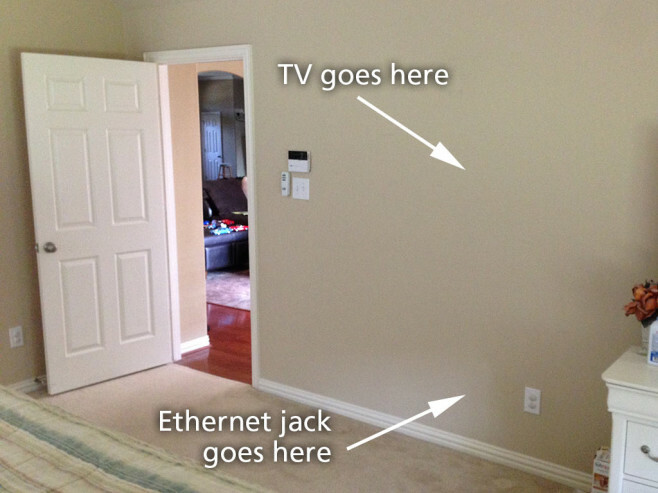 Unfortunately, two jacks in two rooms do not a whole-house network make. Even the home’s previous owner must not have been satisfied, but his gripe was apparently just with the placement of the existing jacks. I found that he’d drilled a hole in the study and the game room walls and ran a 50-foot Ethernet patch cable between them — without even installing keystone jacks or wall plates. Just holes reamed in the drywall and male RJ-45 ends sticking out. It was ghetto, but I used the setup for a while because those makeshift holes where next to where I’d mounted my plasma TV and game consoles upstairs, and it was easier than redoing the wire job properly. This spring, however, as my wife Apple and I started to get into the mood to clean house and do a little renovating and refurnishing, the subject of network connectivity came up. Apple likes to watch TV shows and movies on her iPad in the back bedroom. The problem with this room is that it’s extremely isolated and is made of 75% exterior walls. Punching a wireless 802.11 signal back there has always been very challenging, especially since the study (where the cable modem and main router live) is in the opposite corner of the house. I set up a repeater nearby, which helped, but it still wasn’t that great — you’d get maybe 7 or 8 megabits of bandwidth back there if you were lucky, and our Internet service gives us a 34 megabit line. So, as we were talking about our plans for the house this year, we decided to mount a new big-screen LED TV on the wall back in the bedroom. We don’t like our two-year-old son watching TV at his age (he doesn’t seem at all interested in it anyway) so we don’t turn it on in front of him, and our game room has no door, meaning there’s very little opportunity for Apple and I to catch a movie or a TV show together. Making the master bedroom a secondary media hub should do that job, we figured. Plus, I can put my spare game consoles back there so I can play games in the evening while staying close to Apple. As a prerequisite for implementing this plan, I sold or disposed of every other TV in the house, including my once-beloved 57″ Toshiba 57HDX82 rear-projection that I’d had for 12 years. Of course, with the wireless Internet connectivity being as choked and spotty as it is back there, adding a whole media center with Smart TV apps, an Apple TV or similar, and game consoles seemed like a pretty dumb idea. So I decided to do something about it one and for all: run Ethernet cable directly from the main router to the back bedroom, then redeploy the repeater as an access point and plug it into the hard line. With that done, we’d have Gigabit wired connections for the TV and its ancillary equipment, plus better wi-fi for devices like the iPad and our phones. I picked up several heaping handfuls of equipment at Lowe’s and Fry’s Electronics: keystone jacks, a punch-down tool, a drywall saw, a stud finder, fish tape, a wearable head-mounted flashlight, and a whole bunch more. My boss was kind enough to let me borrow a box containing hundreds of feet of solid core Cat6 Ethernet cable which he had left over after wiring up the new office building last summer. It was quality stuff and saved me a bunch of money versus buying a box of my own. After reading up on how to drill down into the top of a wall and fish wires through it, I set to work. The problem with this wall, as you probably can’t tell from the picture, is that our back patio is on the other side of it. In other words, it’s an exterior wall. As I scanned the wall with my stud finder, I realized that there was most likely a horizontal fire block in the middle of the wall right where I would be trying to fish the Ethernet cable. The stud finder’s AC wire detector was also picking up live electrical all over the vicinity. It was too much to be realistic, but there was an AC outlet just a foot or two away from where I wanted my Ethernet jack, so there was definitely some danger involved. Even if I had been willing to chance cutting into a wall near live AC, there was no way I could deal with a fire block (other than to cut out a huge piece of drywall, drill a hole the block, and then patch the wall back up: not happening). I checked a few more walls in the bedroom but found similar obstacles and dangers embedded in all of them. It looked like I was going to have a pretty hard time running cable back there after all. While scouting around up in the attic, however, I had noticed Cat5e Ethernet cable running all over the place. I knew there had to be some of it up there, because the house did have those pre-installed Ethernet jacks in the game room and study. But I’d seen too many cables up there to account for the jacks I knew about. I had even seen one, in fact, running all the way out to the back bedroom. On a hunch, I pulled the old RJ-11 phone jack out of the wall in the bedroom and discovered that it had been wired up with Cat5e! Only two of the twisted pairs were used, as per the usual for POTS (plain old telephone service). So, then, the builders wired up all the phone jacks in our house with Cat5. A quick check of the Internet revealed that this is now common practice, due to cost equivalence if nothing else. Since we don’t have POTS service and have no intention of ever having it again, I decided that this phone jack was going to be my solution. I’d simply re-wire the RJ-11 terminus with an RJ-45 data jack. The only question then was, what did the Cat5e cable look like on the other end? Eventually I found it, and the Cat5 cables from the rest of the house’s phone jacks, all running outside the garage (without even a conduit!) into this box which had, of all things, Time Warner Cable’s logo stamped on it. This is effectively the telephone hub for the entire house, and the wiring was a damn mess. I couldn’t make sense of it — two pairs from a single Cat5 cable were wired up to one block here, and the other two pairs to another block there. Then again, I have no idea how phone service is wired and I’ve never looked in a box like this. I decided, however, that trying to figure out which Cat5 cable was the one from the bedroom — and then how to extricate it and get it back into the attic from out there — was more hassle than I felt like dealing with. I decided to just cut the cord, literally. Our home’s previous owner was nice enough to install flooring in the attic over the garage, and that’s also where all of the phone wiring runs before making its way out to that box. I decided to climb up there, cut the cable to the master bedroom, and then terminate it with an RJ-45 receptacle. Then I’d run a new cable from the study to the garage attic, terminate it with an RJ-45 receptacle too, and then connect them with a short patch cable. 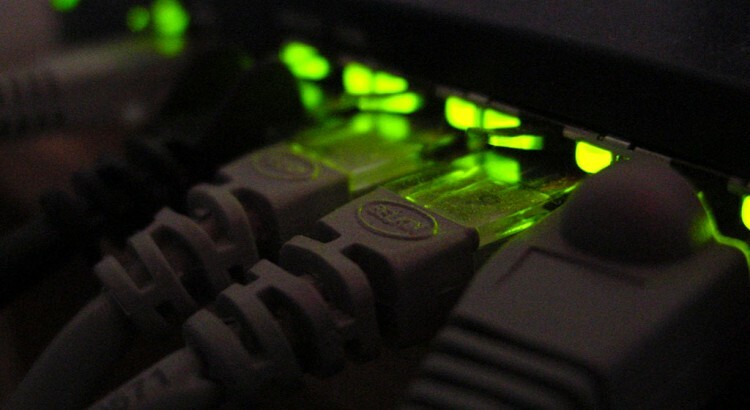 Both RJ-45 receptacles would be shielded to minimize potential signal degradation. Obviously the Cat5/6 standard calls for a solid cable run from one terminus to another, and that couplers or patches like this should only be used temporarily. But this was going to be a much higher quality job than the stranded patch cable I found running through my game room wall, and that had been working great for me since we moved in. I decided that my solution was more than sufficient. The first thing I did was cut a rectangular hole in the wall of the study and install a proper “old work” plastic bracket to which a wall plate could be mounted. I then went up in the attic, found the hole through which the existing Ethernet cable had been run, and stuffed a 1/8″ steel fish tape down there toward the hole I’d cut. Returning to the study, I pulled out the fish tape and used electrical tape to attach the end of a new Cat6 cable to it. 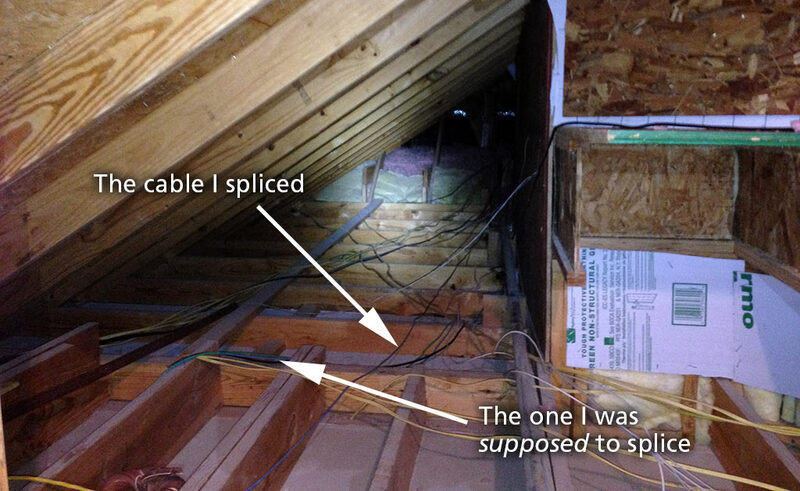 Back in the attic, I pulled the Cat6 cable through and then made my way carefully through the unfinished attic, walking on joists the whole way, until I wound up above the garage. I gotta say, the DeWalt headlamp I bought for the task was absolutely essential here, as there was no light to see by and I needed both hands to grab hand-holds along the way. After running the first cable out to the garage attic, I fished another cable up the wall to replace the ghetto patch cable drop between the study and the game room. Again using the existing hole in the wall, I fished the new cable into the game room with a few feet of extra slack. Finally, I got the hell out of the attic, which at 3:00 in the afternoon in Texas is the approximate temperature of a raging inferno. Later in the day, after our son went to bed, I spent the evening finishing the job. Over the garage, I used wire cutters to forcibly terminate the cable from the bedroom, then punched it down into a Shaxon shielded Cat5e receptacle from Fry’s. I punched down another such receptacle on the end of the cable I’d run from the study, and then connected a 3-foot patch cable between the two of them. Lastly, I labeled all of the cables and used electrical tape to cover up the loose end leading down to the phone box. Finally, I went back down to the bedroom to plug in a laptop and test things out. To my chagrin, I had absolutely zero connectivity whatsoever. The laptop insisted that I hadn’t connected anything at all. This was pretty cut and dried, so I decided to start doing piecemeal testing to find the failure point. Taking the laptop back up to the attic, I tested the Cat6 cable from the study and found that I had full-speed connectivity. I also tested the 3-foot patch cable and found it to be trouble-free, too. While I was trying to figure out how I might test the hard line running to the master bedroom, I considered the fact that I might have somehow cut the wrong cable — because that would produce exactly the results I was seeing. Since I was already up in the attic, I strapped on my headlamp and crawled back there to see if that was the case. In short: Yep. I’d cut the wrong line. Apparently, I cut the Ethernet line that was meant to provide phone service to our home security system (assuming we actually had any phone service, which we do not). This cable was identical in appearance (blue Cat5e) to the one I intended to cut, and even ran back to the same room, since our security panel is in the master bedroom closet. Unfortunately, it was nevertheless the wrong line. After finding the correct cable, I re-did that portion of the wiring job and returned to the bedroom. At last. Full speed, 34 megabits downstream from the Internet. A file transfer from my computer in the study yielded speeds 80% of the router’s maximum potential bandwidth. We were in business! After reconfiguring the repeater as an access point and installing it in the bedroom, I finished the job around the rest of the house: installing keystone jacks, wall plates, labels and other finishing touches for my new wiring job. I now have pure solid-core Cat6 all the way from my main router to my Gigabit switch in the game room, so my primary gaming area is ready for maximum speed. And the master bedroom, too, is finally ready for some serious media consumption. Now all I need is that big TV to hang up there. And of course, a TV is going to cost me far more than the approximately $77 in parts and equipment I picked up from Fry’s today. The research phase begins. 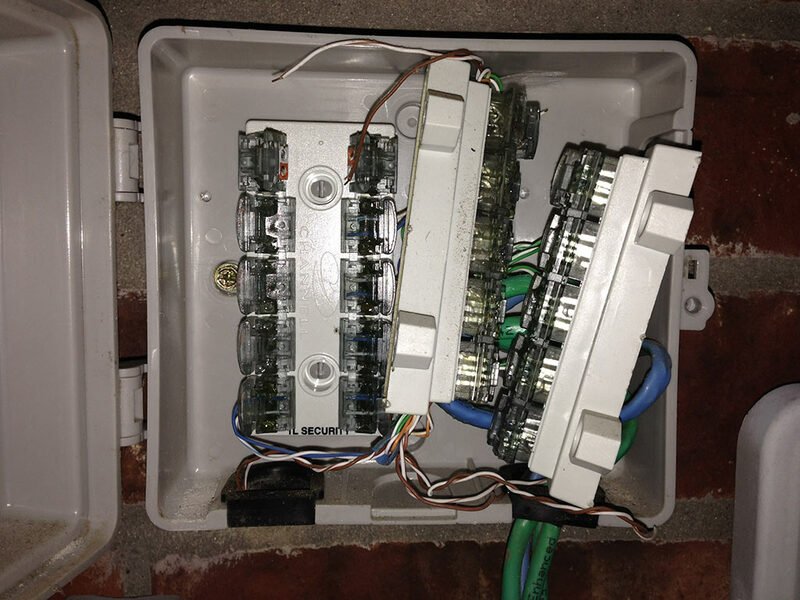 For now, though, I am happy to have completed my first in-home wiring job — successfully, at that. Interesting reading. You’ve now eclipsed my home wiring experience, and am glad you decided to go with a permanent in-wall installation. Proud of you, son! Thanks! I got lucky that there was Cat5 already running to the phone jack out in the bedroom, or this job would have been really difficult. At this point I feel like I could fish a cable through just about any interior wall, but these exterior walls are a nightmare.